y 1881, the leadership of the United Brethren was becoming more liberal and progressive. Milton Wright, an outspoken dyed-in-the-wool conservative, was not re-elected to his Bishop's post and the leadership reassigned him. The Wrights moved back to the Midwest and the Milton became a circuit preacher once again, operating out of Richmond, Indiana. 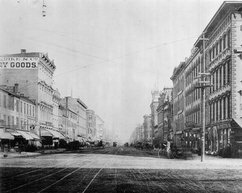 While in Richmond, he founded a monthly religious newspaper, The Star, for fellow conservatives. Wilbur constructed a machine to fold the papers for mailing -- perhaps his first original invention. Orville proved just as enterprising, in his own way. He made kites and sold them to his friends, scavenged wood, bones, and junk metal, organized an "army" of neighborhood children, even staged an amateur circus using a cache of stuffed animals he and his friends had stumbled into. The move also placed the Wrights within visiting distance of their maternal relatives, the Koerners. Their grandfather, John Koerner, had died in 1876 after turning over the family farm to his son, Daniel. While he lived, John was a skilled carriage maker -- more of a carriage manufacturer, really. His farm near Liberty, Indiana boasted upwards of a dozen buildings, including a forge. 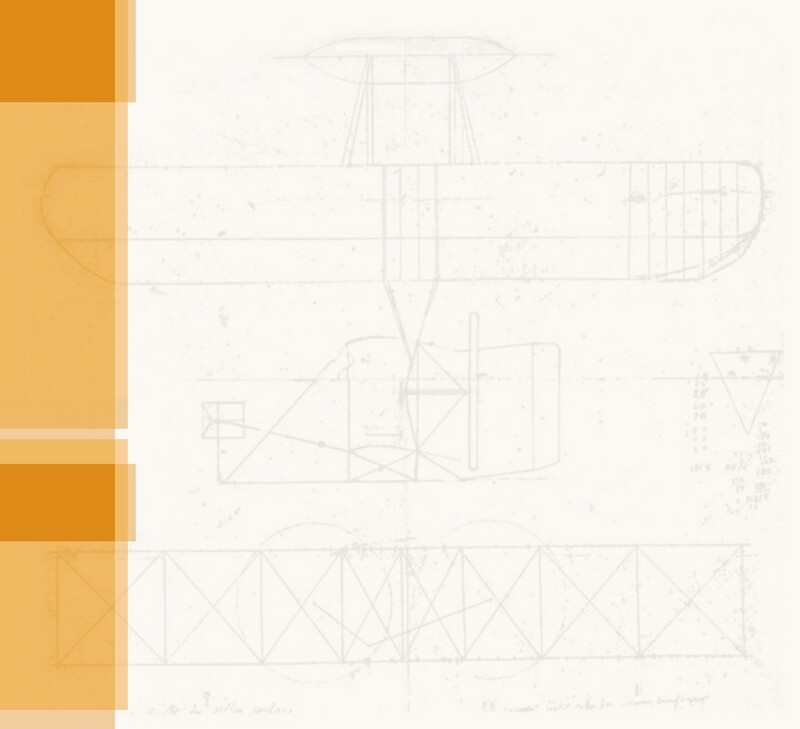 An operation this size suggests that he had a large selection of tools for a variety of crafts, including woodworking, metalworking, blacksmithing, and leatherwork. Although their Uncle Daniel preferred to make his living as a farmer, he had trained under his father making wagons and carriages. When the Wright brothers visited the Koerner farm, they would have marveled at these tools and have been able to question their uncle about their use. Their mother had taught them to make things, their many projects showed they enjoyed doing so, and their interest may have peeked considerably during these visits. Whatever the effect of their visits to Uncle Daniel's farm, Will and Orv developed a fascination for tools and what they could do with them. They decided to build their own treadle-powered wood lathe, which Orville would later recall was their first partnership in a technical venture. Believing that the lathe would run better with ball bearings, they made their own from clay marbles. It was an innovative idea, even though it failed miserably – the lathe ground the marbles to powder in a matter of minutes. They managed to get the lathe working with more conventional "sleeve" bearings, possibly given to them by their uncle. Meanwhile, Milton was having his own troubles. As the progressives in his church began to press for change, Milton Wright sensed there would be a showdown with conservatives. 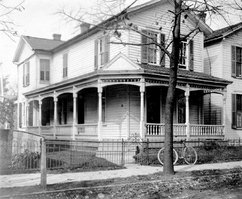 Wanting to get back into the fray, he decided in 1884 to move back to Dayton, the political center of the United Brethren Church. It was the last time he would move his family, and the Wrights settled permanently in Dayton, Ohio. 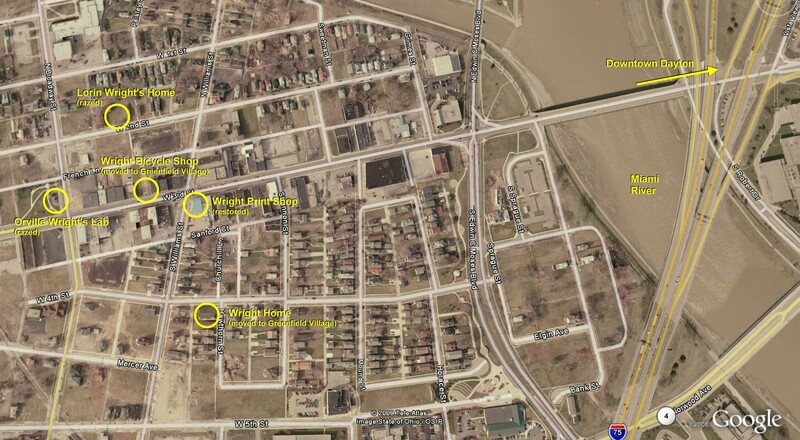 Map of West Dayton – A Google-eye view of the Wright brother's Dayton neighborhood, showing the location of their home and places of business. 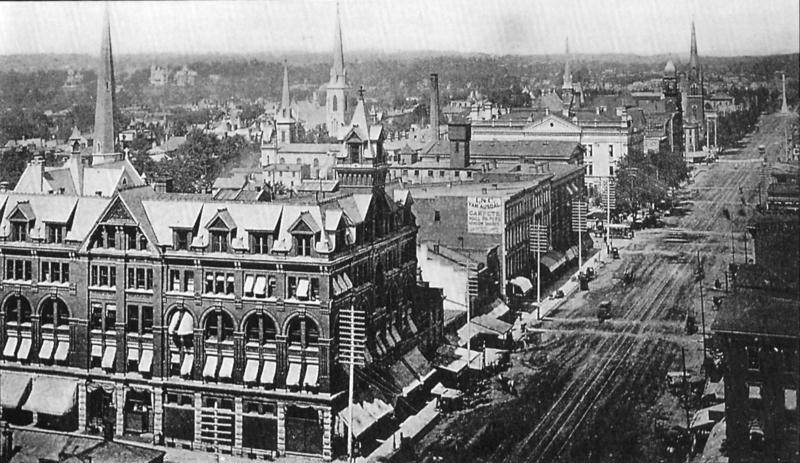 Downtown Dayton, Ohio in the 1880s. 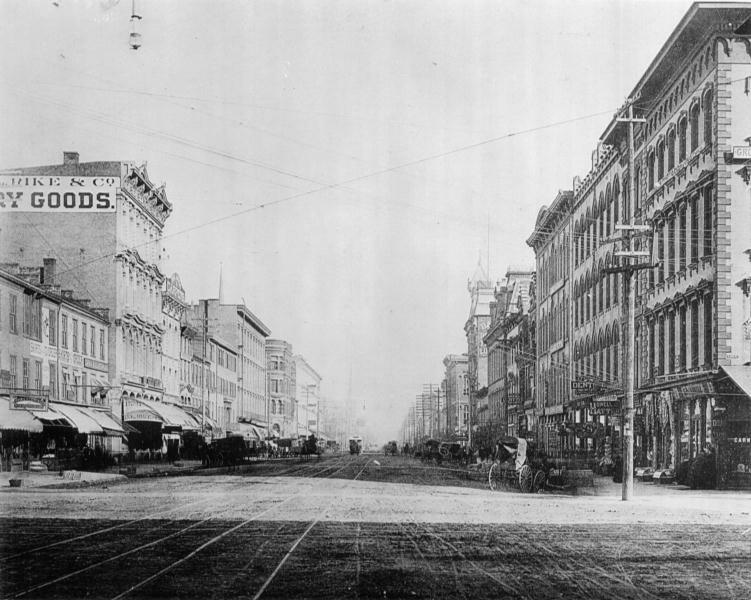 Looking west down Third Street in 1885, Hawthorn Street would be across the river and to the left. Looking south on Hawthorn Street about 1900. 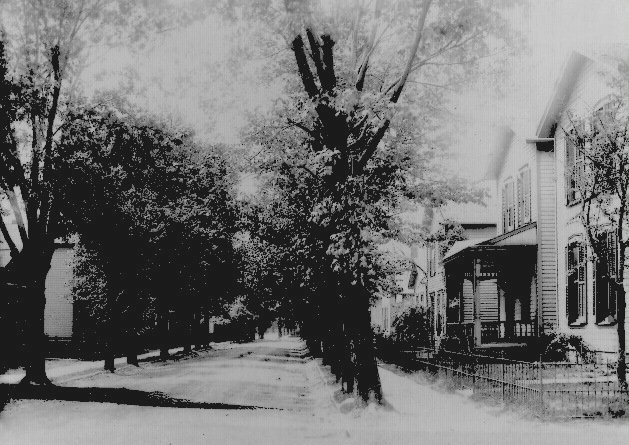 The Wright home is the second on the right. 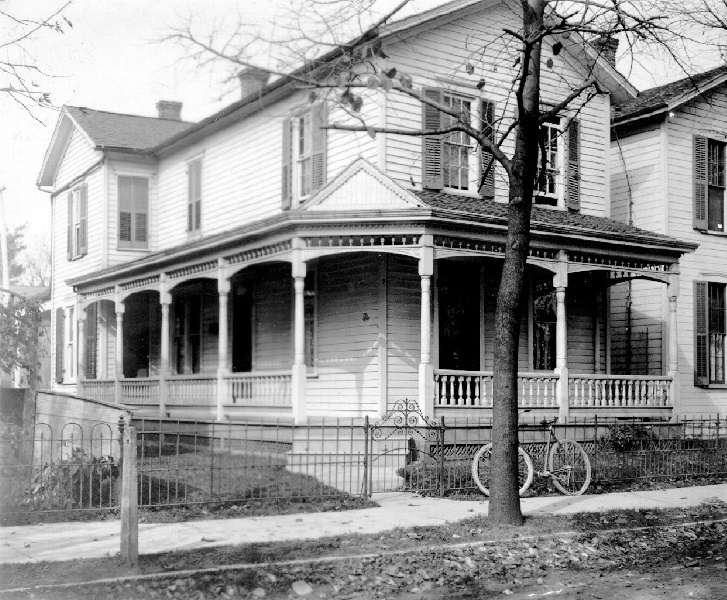 The Wright's home at 7 Hawthorn Street, Dayton, Ohio, in 1900. That is probably a Wright bicycle leaning against the wrought iron fence.